So that's when I'm eternally grateful to publishers. They have events, like author dinners and seasonal previews, to promote their books. This gets me out of the office, networking, eating, and usually carousing around Manhattan. These sorts of things get me through the daily routine. 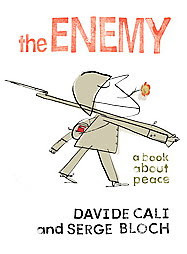 Imagine my surprise, shock, and excitement when I received an invitation from Random House to attend an exhibition for The Enemy: A Book About Peace by Davide Cali and illustrated by Serge Bloch (Schwartz & Wade, 2009)...at the United Nations! Huge smile and an enthusiastic yes! After airport-level security checks and getting lost in the labyrinthine halls of the U.N. building, I arrived at the event. 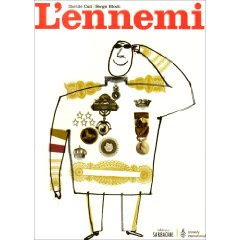 I met Serge Bloch, the illustrator, though I seemed to get tongue-tied and still can't remember what I said to him. I'm certain I said nothing of any significance. Also, as I looked around, I realized that 3/4ths of the people there were French, which wasn't surprising since the invitation was actually from the Association Culturelle Francophone. The exhibition was in a major walkway so that as many people as possible could see the artwork on display. On the right side was the art from the American edition of the book, printed on large foamboard, in double-page spreads. On the left side was the art from the French edition, printed in the same manner as the American version. I read French well, though my accent and listening comprehension are nothing short of embarrassing. So I read through the French edition. It was at this point that I ran into Jeanne Lamb from New York Public Library. She also understands some French so we were able to discuss. The first thing we noticed was the length: the French edition is longer. In the midst of talking about this, a Frenchwoman commented that the reason for this was "because the attention span of American children is so much shorter." I told her I didn't necessarily find this to be true. American adults (and adults from other countries) may believe this to be so, but I certainly don't think it's true. The parts of the book that were cut? Vivid descriptions of "the enemy". In particular, in the French version, "the enemy" kills women and children, and this part of the text was illustrated by a stick-figure-esque little boy with a sword or knife in his side, laying on the ground. It's not graphic, as the art is minimalist and seemingly simple. Nevertheless, the imagery is still potent. Naturally, this started an exciting discussion about what is "appropriate" for children. The American version being what it is, I could definitely promote it to 1st-2nd graders, especially in a school setting where children will have questions about war and peace. But that's my opinion. By the same token, Jeanne also saw potential in using it with middle school-age kids as well. Schwartz & Wade, in making their editorial decision, definitely opened the book up to a wider American audience. On the other hand, I do feel obligated to point out that I was disappointed to see the shortened version. I just worry that it's part of the "dumbing down" of America, not to mention that one could argue that it compromises the integrity of the author and illustrator's original work. Don't get me wrong - I am not disagreeing with the editorial decision. Instead I'm questioning our culture and society at large and, as such, Schwartz & Wade had to make a decision that would help the book sell. I can't fault them for that. Laura: (whispers) Is it just me or is everyone here stunningly beautiful? Tracy: (whispers back) Well, yeah. They're all French. There were speeches made - all in French, save Lee Wade. Luckily, everyone spoke pretty slowly so I understood most of the French. The word "exposition" was repeated. I explained to Tracy that "exhibition" in French means when someone flashes you. "Exposition" is what you want to use when talking about art. An amazing evening. I walked out of the U.N. with a bounce in my step that I didn't have earlier, and I felt like a pretty lucky gal, having a sometimes-monotonous job that allows me to see and experience cool things...like the U.N. and samurai swords. I am so glad you posted about this as I was unable to go (or to the samurai swords event either and also appreciated your write-up on that one). So cool. When this was discussed at a preview I put multiple stars beside it, and really want to get it into the hands of our teachers!